All of us at Titan Creative Entertainment love a good polka with a great smile. That’s why we are so happy to offer Canada’s undisputed best accordionist, Walter Ostanek and The Walter Ostanek Band! Recording albums since 1963 and performing Cleveland-Style Polkas and Waltzes Ostanek has become known as Canada’s Polka King, He has received three Grammy Awards is a member of Canada’s Walk of Fame as well as the Polka Halls of Fame in Cleveland and Chicago. 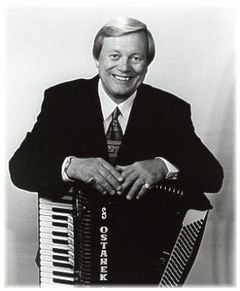 Ostanek hosted his own television shows (one for fourteen consecutive years), radio shows, and polka tours. He has appeared in concert with Roy Clark, the Oakridge Boys, Ronnie Milsap, Ray Price, Mel Tillis, Brenda Lee, Slim Whitman, Tom T. Hall, T. G. Shepard, Tommy Hunter, Lawrence Welk, Myron Floren, Frank Yankovic and Weiss Blau. He is also the subject of the documentary The Cult of Walt: Canada’s Polka King. Ostanek is also cited as the inspiration for the Second City Television polka parody, the Shmenge Brothers.